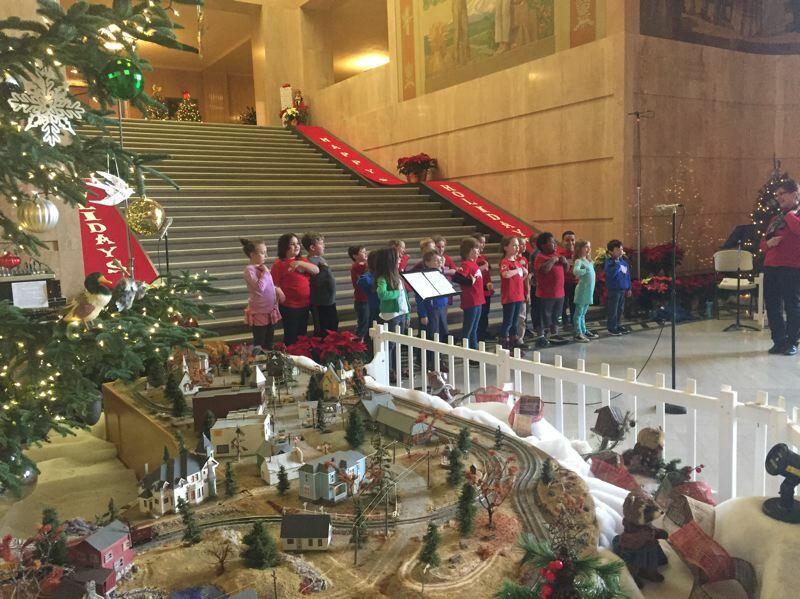 More than 500 Oregon schoolchildren will sing carols at the Oregon Capitol in Salem during the holiday season. SALEM — First-graders from Salem's Crosshill Christian School curl their arms into wing shapes, flap around the rotunda of the Oregon Capitol and belt out: "Three French hens, two turtle doves and a partridge in a pear tree." The class of nearly 20 first-graders is among more than 500 students who are performing Christmas carols at the Capitol this holiday season. The decades-long tradition has gained such popularity that the Capitol's Visitors Services employees no longer have to reach out to schools to book the performances. 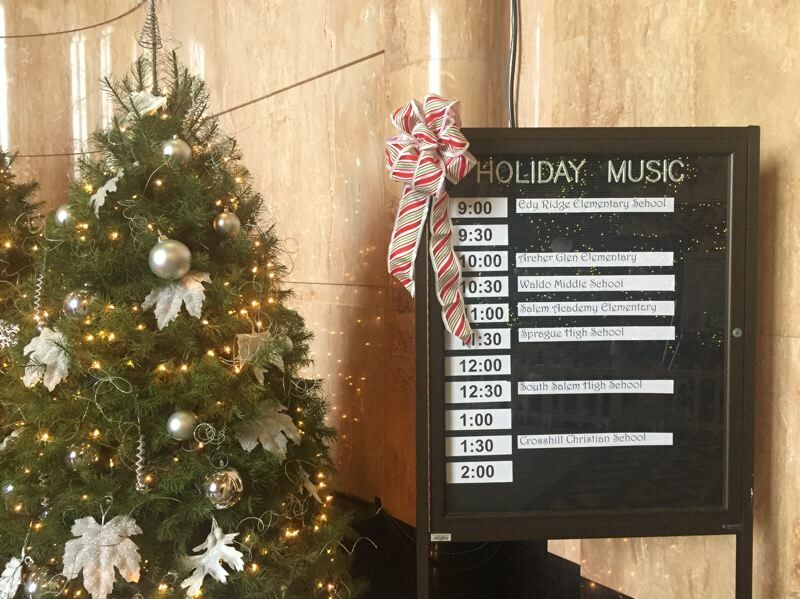 School choir directors call each year to claim their spot on the schedule. "I remember singing here when I was a child so it was fun to see my daughter sing here," said Danielle Johnston, mother of Crosshill first-grader Parker Johnston. Surrounded by a magical scene of Christmas trees and holiday adornment in the rotunda, the choirs sing from about 10 a.m. to 2 p.m. Monday through Saturday until Dec. 22. Parents, passersby and state employees fill audience seats. Some state employees bring their lunches to the rotunda so that they can watch the performances during their break. "Our world is a chaotic place right now," said Robin Maxey, communications director for Senate President Peter Courtney, D-Salem. "We see and hear a lot more about the bad than the good in it. To be able to see the joy of the season on the faces of these children and teenagers every day gives me a lift. It restores my faith in the future." Maxey keeps closed-circuit footage of the performances turned on in his office upstairs for most of the day. The performances also are streamed live online. "Having it in office doesn't compare to being in the rotunda and actually hearing them, but it's a busy time of year for us prepping for session so we can't always get out there," Maxey said. Sherry Chandler of Visitors Services, who schedules the choirs, sits at an information desk near the rotunda for the most of the day. She said she never tires of hearing the carols. "The little ones have sweet, little voices, and in the middle school and high school choirs, there is very good talent. Sometimes, you hear the same carols over and over. This year, they were mixing it up a little." The carolers bring a starkly different scene to the Capitol, where during other times of the year lawmakers may bicker over bills and lobbyists pace the halls. "The kids aren't wearing thousand-dollar suits and lobbying for bad causes," quipped Arthur Towers, a lobbyist for Portland-based Oregon Trial Lawyers Association. "It's heartwarming as opposed to heartbreaking." Scott Jorgensen, chief of staff for Sen. Alan DeBoer, R-Ashland, said he got sick of hearing Christmas music in his past life as an employee at Fred Meyer, where the music cycled constantly from Thanksgiving to New Year's. "It's different when the school kids sing," Jorgensen said. "I absolutely love it. I think it's easy to lose sight of how special it is when you're there every day. "Through the eyes of schoolchildren, especially schoolchildren from the rural parts of the state, it's a really big deal to be able to come to the Capitol. You can see it on their faces how thrilled they are. It really warms your heart to see the groups of kids singing."